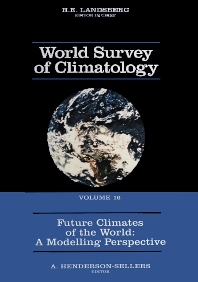 Future Climates of the World: A Modelling Perspective is Volume 16 of the highly prestigious series of climatology reference books World Survey of Climatology. The present volume offers a state-of-the-art overview of our understanding of future climates and is aimed at climatology undergraduates, interested non-climatologists with a scientific background as well as the generally interested reader. Each topic is discussed clearly so that the full implications of its affect on the earth's future climate can be fully understood. The study of climate has moved from data collection climatology'' to the model and experimentally based predictions ofclimatic science''. Our understanding of climatic prediction depends crucially upon improvements in, and improved understanding of, climatic models. The book compises four main themes which follow an introductory chapter i.e. the geologic perspective (I) and present-day observations (II) as they pertain to future climates; human factors affecting future climates (III) and planetary geophysiology and future climates (IV). 1. Climates of the Future (A. Henderson-Sellers). Why consider the climate of the future? Focus of this book. Relationship to other reviews of the future climate. I. GEOLOGICAL PERSPECTIVE ON FUTURE CLIMATE. 2. Modelling the Response of the Climate System to Astronomical Forcing (A. Berger). Climates of the past. Astronomical theory of paleoclimates. Snapshot'' simulations of past climate. Simulations of temporal evolution of climate. Transient response of a 2-D climate model to astronomical forcing. Future climates under astronomical forcing. 3. Warmer Worlds: Global Change Lessons from Earth History (E.J. Barron). Cretaceous warmth. An alternative warm climate: an Eocene example. 4. Catastrophe: Impact of Comets and Asteroids (M.R. Rampino). Theoretical estimates of impact-induced climate change. Evidence of environmental perturbations at the K/T boundary. Other geological boundaries: climatic changes and possible role of impacts. Impact-induced volcanism? Climatic changes caused by flood-basalt eruptions. Future climates? II. OBSERVATIONS OF CLIMATE AND FUTURE PROJECTION. 5. Observations from the Surface: Projection from Traditional Meteorological Observations (P.D. Jones). Development of instrumentation and meteorological observational networks. What surface observations tell us about the last 140 years. The last 140 years in a longer term context. Upper air data during the last 40 years. Explanations of the instrumental temperature record. Projections to the future. 6. Climatic Variability on Decadal to Century Time-Scales (H.F. Diaz, G.N. Kiladis). Climate variations in the past 1,000 years. Possible causes of climatic variability on decadal to century time-scales. Climates of the future. 7. Satellite Systems and Models for Future Climate Change (R.E. Dickinson). Global radiation balance and the role of clouds. Precipitation. Atmospheric dynamic and thermodynamic fields. Land surface properties for climate models. Oceans and cryosphere. Satellites and future climate. 8. Dynamics of Future Climates (B.J. McAvaney, G.J. Holland). Diagnostic methods. Large-scale dynamics. Regional-scale interactions. Future climate dynamics. III. HUMAN FACTORS AFFECTING FUTURE CLIMATE. 9. The Greenhouse Effect of Trace Gases (W.-C. Wang, M.P. Dudek, X.-Z. Liang). Uniformly mixed gases. Atmospheric ozone. Future climates. 10. Climatic Effects of Changing Atmospheric Aerosol Levels (M.O. Andreae). Aerosol sources. Climatic effects. Evidence for the climatic impact of anthropogenic aerosols. The effect of atmospheric aerosols on future climate scenarios. 11. Ozone Depletion (G.P. Brasseur, J.C. Gille, S. Madronich). Ozone photochemistry. Ozone in the polar regions. Ozone observations. Ozone depletion. Ozone changes and the climate systems. Increases in ultraviolet radiation due to ozone depletion. Policy strategies to protect the ozone layer. Issues for research pertaining to future climates. 12. Human Effects on Climate Through the Large-Scale Imapcts of Land-Use Change (A. Henderson-Sellers). Human-induced land-use change. Land-cover change influences on climate. Regional-scale impacts of land-cover change on climate. Future land-use change and future climate. IV. GEOPHYSIOLOGY AND FUTURE CLIMATES. 13. Urban Climates (H. Cleugh). Urban climate processes. Current and future urban climates. Future urban climates. 14. Future Climate Surprises (T.-H. Peng). Changes in climate and ocean circulation in the past. Atmospheric CO2 variations in the past. Causes of glacial-to-interglacial change in atmospheric CO2. Role of ocean conveyor circulation. Future surprises. 15. The Geophysiology of Climate (L.R. Kump, J.E. Lovelock). Climate regulation. Geophysiology of paleoclimate. Geophysiology of future climates. References Index. Geographical Index. Subject Index.